WEALTHY AMBASSADORS OF GOOD REPUTE WANTED THROUGHOUT THE WORLD. The Empire of EUROPA and the Kingdom of LITHUANIA have existed together once more since 24 May 2005, ruled by the De Jure (and rightful De Facto) Royal Sovereign, His Imperial Majesty King Roman the First, from Darwin Australia. The Empire of Europa is a new empire created from inherited and accrued titles, and the Kingdom of Lithuania was renewed by the Monarch and Sovereign of Lithuania in 2004. Contrary to some opinion, Lithuania has had three kings, and by inheritance the current king His Imperial Majesty King Roman 1. King Roman visited Vilnius twice: in 1994 when he was elected to the first independent LBKS Senate; and in 2007 when he found the Parliament closed! He also contacted Lithuanian republican PMs without success. Because of the considerable population growth in the three constituent regions since the high days of the Grand Duchy in 1569, all three - Lithuania, Belarus, Ukraine - each now deserve and have been granted by His Majesty separate titles of Grand Principality, as also Latvia and Moldova, as from 30 June 2018. Together, the Grand Principalities of Lithuania, Belarus and Ukraine constitute the present lawful/de jure, usurped Kingdom of Lithuania. This Kingdom of Lithuania in turn is now the principal part of the Empire of Europa, which was created on 24 May 2005 when King Roman crowned himself, just as the Emperor Napoleon did more than two centuries ago. The Europan Empire was founded on May 24, 2005, and was proclaimed by His Imperial Majesty King Roman 1, who resides at the Imperial Europan/Lithuanian Embassy/Palace, 124-7 Progress Drive, Coconut Grove NT 0810, Darwin Australia. The Empire of Europa comprises territories of Grand Lithuania (Lithuania-Belarus-Ukraine), plus the legally accrued territories of Latvia and Moldova. All republican claims to the Europan Realm are usurped and illegitimate. (Early attempts since 1991 to include the De Jure Sovereign, His Majesty King Roman, in the Lithuanian constitution, were ignored, and the matter has been put before the European Parliament and the United Nations General Assembly). Monarch His Imperial Majesty King Roman - Prerogatives of Monarch: 1. approve and dismiss Ministers; 2. proclaim laws; 3. establish Royal courts; 4. raise taxation; 5. deploy defence forces; 6. have immunity from suit; 7. grant honours. Defence Forces His Imperial Majesty King Roman 1 is Supreme Commander of the military. The Europan Defence Forces consist of Imperial Army, Navy, and Air Force, to primarily protect and defend His Imperial Majesty, Government, and Embassies. Goal His Imperial Majesty's aim is to gain full recognition of his Realm and Monarchy, and to obtain establishment of a suitable world body to mediate on behalf of deposed monarchs to obtain the proper respect and dignity from world leaders, their return to full recognition, or alternatively to obtain proper restitution from usurpers. History: The Empire of Europa is an Imperial Kingdom constituted by the Kingdom of Lithuania, the Grand Principality of Latvia and the Grand Principality of Moldova. The Kingdom of Lithuania (formerly Grand Duchy) comprises the Grand Principalities of Lithuania, Belarus and Ukraine, the three having been granted equal rank by King Roman. The Grand Principality of Latvia is formed by the Duchies of Courland and Livonia. His Imperial Majesty King Roman originally inherited the Grand Principality/ Duchy of Lithuania in 1967, when his father the hereditary Grand Duke Roman 1 died (22 November). In 1991, the Grand Duchy of Lithuania, which originally contained the territories of Lithuania, Belarus, and Ukraine, obtained independence from the Soviet Union, and ignored their joint royal history by becoming separate republics, and usurping the rightful royal heir. The situation occurs because the United Nations as yet has no institution or royal court to mediate recognition of monarchy or restitution, and to require enforcement of resolutions. His Imperial Majesty's aim is to gain full recognition of his Realm and Monarchy, and to obtain establishment of a suitable UN body to mediate on behalf of deposed monarchs to obtain the proper respect and dignity from world leaders, their return to full public recognition, and alternatively to obtain proper restitution from the current usurpers. I am a European Citizen (Scottish) and a de jure European Monarch, with rights and privileges under International Law for which I am seeking redress, restoration and/ or restitution. My claim to the Grand Duchy of Lithuania is inherited and prescriptive. Lithuania, Belarus and Ukraine obtained independence from Russia in 1991, following around 200 years of subsumption by Russia from around 1793. 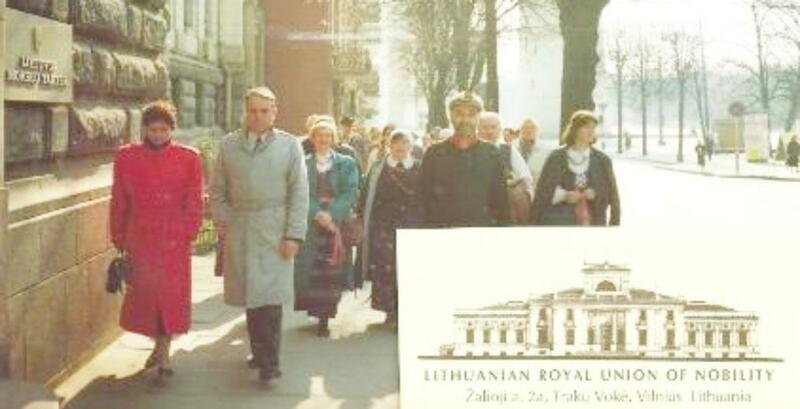 In 1991, they became separate republics, not by choice of their people, which was usurped; and despite the Royal Lithuanian Nobility Society (LBKS) expressing its desire for restoration of monarchy in 1994. The people never had a free choice, for which it may be too late now. My claim for formal recognition of the Grand Duchy (now Kingdom) of Lithuania and the Grand Duke (me) rests firstly on inheritance from the princely Gedroyc dynasty (Rose over Hippocentaur) which exists from the 13th century. My claim for formal recognition of both is secondly prescriptive. The Gedroyc claim as well as that of the Grand Duchy were kept alive by letters patent from Russia throughout the around 200 years of subsumption. These letters patent include 1811 Vilnius and St Petersburg (copy of the first of which, with other evidence and International Law principles, appears on my official website - www.KingRoman.org ), and 1873 St Petersburg. I inherited the Grand Duchy (properly Grand Principality in its Polish original) of Lithuania in 1967, when my father the Grand Duke/ Prince Roman Dambski 1 of Lithuania, and Count of Lubraniec, died. In 1992, I visited Warsaw and was taken to visit his tomb at Brama 4, whose headings are inscribed with both titles. The same year, the Gedroyc Firstborn/Heir/Crown Princess, Paulina Dambski (Mostyska 1904-Warsaw 1993), who married my father in 1927 at Lwow, enjoined upon me to restore recognition of the Grand Duchy and Family titles, which include many other titles legally accrued to the Grand Duchy (now Kingdom). My sister Christine (1945) and I (1942) were born during the wartime period 1940-1947 (after Paulina was officially declared dead). We are the Scottish (and surviving) children of Grand Duke Roman 1 who, as a Polish officer, was stationed in Edinburgh throughout that period, at the Paderewski Hospital attached to Edinburgh University. Many times I have written and emailed Lithuanian and other EU and world states, but I have been generally disrespected and ignored, contrary to the principles inherent in International Law in regard to dispossessed monarchs and monarchy, which is a subject of Professor Stephen Baca y Kerr's two volume work The Entitlement to Rule. This disrespect is a result of the failure of the UN to support and enforce these rights and privileges of the dispossessed monarch (De Jure Sovereign) by appropriate legal mechanisms. The International Law is there, yet in this particular area it is not pressed. The dispossessed monarch is thus left in limbo, unrecognized and powerless, and the Grand Duchy/ Kingdom of Lithuania remains usurped. I seek formal recognition of the Grand Duchy of Lithuania and of her currently De Jure Sovereign. Or an order from the European Parliament or appropriate court for proper personal and Grand Duchy/ Kingdom of Lithuania recognition. And/ or suitable and appropriate restitutions to me and the Grand Duchy for associated property and other losses.